0.1 How Does An Oil Filled Heater Work? Oil filled heaters are a type of convection heaters. They are really cheap compared to other heaters in the market. They possess numerous benefits which other types of heaters cannot match. That is why this type of heaters are very common right now. But many of us do not understand how they work and what the benefits of having an oil filled heater are. People often have misconceptions of them. So, we have put our efforts on this article to ease you with making decisions and to let you know about some of the best oil filled heaters in the market right now. How Does An Oil Filled Heater Work? Every day we use our home appliances with indifference, as simple as the way we breathe air. But we never question their technicalities. Most of them work in a magnificent way that we never imagine. But those of us who are mesmerized by the beauty of machines will find an oil filled heater thought to provoke. Many of us have the misperception of how an oil filled heater works. People think that it operates by burning oil, which is totally not true. Oil filled heaters use electricity as a general source of energy. The oil inside is just for reserving the heat. There is an electrical element that is drowned in the oil inside the heater. When current passes through the heating element, it warms up the oil. You may be wondering why the heater uses oil, instead of other liquids. The reason is – oil has a higher boiling point compared to other forms of liquids and can contain heat for a longer period of time. So, the oil stays as liquid and does not evaporate thanks to the high boiling point. Also, you do not need to provide high pressure to keep it in liquid form. The trick is very simple yet wonderful to think about. Oil filled heaters operate by following the simplest rules of physics. 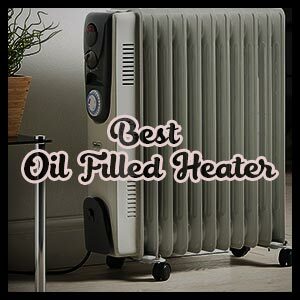 Now that you know how an oil filled heater works, let’s explore some of the best oil filled heaters in the market right now. We handpicked these amazing heaters for your consideration. After going through them, it will be much easier for you to make a decision regarding buying the best oil filled heater. If you live in a studio apartment or need to heat up a large room, then you should totally go for DeLonghi EW7707CM. This wonderful heater comes with new and amazing features which have won the hearts of many customers. SafeHeat Technology: The benchmark for any electrical home appliance is how serious they are about the safety issue. 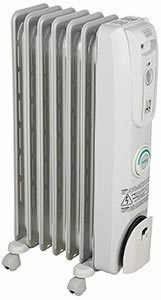 Considering that, DeLonghi EW7707CM Safe Heat 1500W ComforTemp Portable Oil-Filled Radiator is one of the finest heaters in the market. Their SafeHeat technology is used only for family use. This interesting feature prevents the heater from overheating by automatic thermal shutoff. So, you will never need to worry about the heater causing a fire. This feature also gives you anti-freeze protection. That means, if you live in an area where the temperature is too low and the pipes have a chance of being frozen, the SafeHeat technology will prevent that too. ComforTemp Button: Want to cut your energy bill cost? Just press the ComforTemp button and relax. This feature automatically maintains the perfect room temperature for you without the need for you to monitor it. Easy-to-use Control panel: DeLonghi believes in user-friendliness. That is why DeLonghi EW7707CM comes with three power settings and an adjustable thermostat just for your customization. The three energy settings are – min, med, and max. Therefore, operating a heater becomes easier than ever. 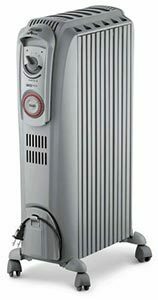 Portable: One of the features that make DeLonghi EW7707CM a great heater is its portability. This heater uses SmartSnap pre-assembled wheels. That means you do not have to assemble the parts of the heater by yourself. Wherever you go, you can shift this heater from one room to another with you. Cons: The price of the heater is a bit on the higher side compared to other oil filled heaters in the market. But the difference is a very small amount to pay for something as good as this heater. This is a great unit. We would totally recommend that you buy this. DeLonghi is a global brand and is renowned for its electrical home appliances. Another addition to the DeLonghi family is DeLonghi TRD0715T. Like the one previously discussed, it is also an oil-filled heater. This unit is very popular among the users for its easy operation and efficiency. Easy-to-use controls: This heater also comes with an adjustable thermostat and three heat settings. With one of these products, you can easily choose a temperature setting according to your desire. Moreover, it offers anti-freeze protection that keeps the heater off freezing. Efficient Heat: The heater is sealed for good with diathermic oil. This unit has seven sealed channels and each of them contains the oil. Diathermic oil is suitable for long-term efficient heating. Once you buy this unit, you will not have to think about refilling ever. The heater has an exterior that does not heat up. So, it is totally safe to touch. Programmable Timer: This unit offers a timer setting that you can set for any time in a day. That means no more reaching out for turning the heater on. Just set the timer, sit back and enjoy warmth whenever you want. Durable: The exterior of the heater is made of the stainless metal element. The corners of it are rounded so that it does not get overheated. The dimension of DeLonghi TRD0715T is 14.17 x 18.11 x 25.6 inches. Vertical thermal tunnels: The way this heater delivers heat is interesting. It uses several thermal tunnels. The heat produced is channeled upward through these thermal tunnels. Therefore, the surface temperature remains low while delivering the maximum amount of heat for the whole room. Cons: Like other DeLonghi heaters, this heater is also a bit expensive. The small fluctuation of the price should not stop you from getting this amazing product. If you like this one, you should not hesitate. The products of DeLonghi are so wonderful that they have won the hearts of many consumers as well as ours. This is one of the first and finest heaters of DeLonghi and is still loved by people for its excellent performance and durability. Silent operation: One of the best features of this unit is that it does not make much noise while operating. You will barely notice it running. This is perfect for those who do not like constant noise going on beside them. With one of these products, you can enjoy a comfortable and silent environment. Permanently sealed oil reservoir: You may think that permanently sealed reservoir is a bad thing, but know that it is not. It means that you will never have to worry about refilling it with oil. The reservoir is made of high quality patented steel, so there is no chance of leakage. Safe to use: DeLonghi follows several safety measures which make its products perfect for family use. 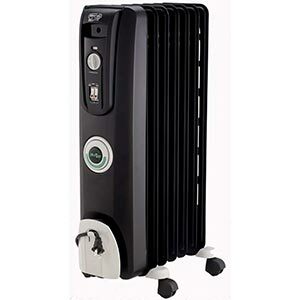 DeLonghi EW7707CB Safe Heat 1500W ComforTemp Portable Oil-Filled Radiator uses thermal cut-off. This system shuts down the heater when it is overheated. So you do not need to worry about the heater causing the fire. Anti-freeze protection: The way DeLonghi EW7707CBprevents the heater from getting overheated; it also blocks the chance of pipes being frozen. Anti-Freeze protection can dictate when the temperature is too low and start working accordingly. ComforTemp Button: This amazing feature is one of the things that make this heater so great. This button works like magic. Just press it and then the heater will automatically maintain optimum temperature for the room. So, even if you ever forget to change the heat setting, the heater will not. This can lower your energy cost and save you a fortune. Portable: No matter where you go, this heater goes with you. DeLonghi EW7707CB uses patented smart-snap wheels. It comes with the heater itself so you do not need to assemble it after buying the heater. So, whenever you are shifting your place, you can always take the heater with you. This one is one of the best oil filled heaters in the market right now. Also, it looks really stylish. Pelonis is a renowned name in the home appliance industry. They have been in operation for more than thirty years and serving people with high-quality products. 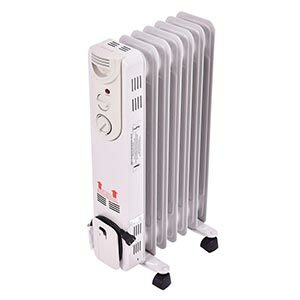 PELONIS NY1507-14A Digital Radiator Heater is one of their finest inventions. This great looking heater is fully digital and is regarded as one of the best oil filled heaters in the market right now. Noise Free: Who likes to hear something making constant noise, right? Keeping that in mind, PELONIS NY1507-14A is specifically designed to be a silent operator. You will not hear a fan making constant noises. Easy-to-use: This heater comes with three basic heat settings ranging from 900 to 1500 watts and five temperature settings – 65F, 70F, 75F, 80F, and 85F – for your ease. Also, this heater has an eco-mode which ensures efficient use of power. Remote control: The best thing about this heater is its digital attributes. It comes with a remote control that lets you on or off the heater and changes the temperature setting from afar. So, forget about getting up from your spot and enjoy the warmth. Tip-over safety switch: One of the interesting features of this unit is its tip-over safety switch. That’s right! If someone or something accidentally knocks it over, the sensor will automatically shut off the heater to prevent further damages to the heater and to your house. Cons: PELONIS NY1507-14A gives only one year of warranty. The warranty is limited to the heating elements, circuit board, and motor. This is one of the best oil filled heater on the market right now, and also my personal favorite. This amazing heater is very effective as well as efficient. If you have a medium/large room to cover, this heater is a good choice. Efficient Heating: This beautiful heater comes with an adjustable thermostat and three easy heat settings – 600W, 900W and 1500W. It has seven slots for delivering heat in the room. These thermal slots are filled with 4 pounds of oil. This makes it one of the most efficient heaters in the market right now. Thermal slots are also responsible for low surface temperature, which is a good thing. 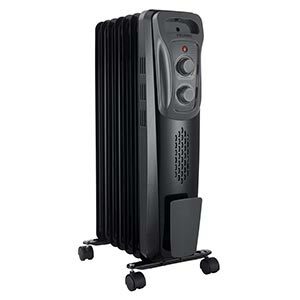 Easy to move: Tangkula Electric Oil Filled Radiator Portable Heater uses four heavy duty caster wheels. You may ask “why does it matter?” because caster wheels deliver swift movement from one place to another. Safe to use: When it comes to the safety issue, Tangkula takes the matter very seriously. They guarantee that their products are safe to use and riskless for the children to be around. It uses a sensor which shuts off the heater the moment it trips over. Quiet operation: Another amazing feature of this unit is its silent operation. You will hardly notice the heater running. Therefore, no constant loud noises to hamper your peaceful and quiet life. Cons: This heater is made for a very small area. You should not use it to warm up a large room. If you live in a small room, then this heater is probably the best solution for you. Before buying any kind of electrical home appliances, the first and foremost thing to consider is the size of that appliance and the size of your household. Oil filled heaters are no exception. Therefore, you must take the measurement of your house/room that you need to warm up and then decide which brand you should choose. Because different heaters come with different heat output capacity. You can just search it on the internet or see the product description to understand the area that particular heater is able to heat up. The number one priority should always be the safety of your house and family. So, always remember that while buying the best oil-filled heater. Make sure the heater allows automatic shutdown when in danger. All the oil filled heaters discussed above are safe to use. They all follow safety protocols like automatic shutdown when the unit gets overheated. Also, check whether the heater has anti-freeze protection. It is very important for an area where the temperature hit a very low level. Some heaters also come with a tip-over sensor which automatically shut off the heater if it tips over. You should also keep this feature in mind. The beauty of an oil filled heater is that the reservoir of the oil is usually permanently sealed, so there is no chance for the heater to leak gas or liquid. So, if you happen to come across a heater that does, probably that heater is broken or not authentic in nature. So, ask the seller whether the heater leaks any kind of gas or liquid. If it does, then do not buy that. By now you know that oil-filled heaters use oil as a heated container. The heat generated by the electric coil warms up the oil which later is distributed through some channels. Now, if the quality of the oil is low, then chances are you’re chosen oil filled heater will not be that efficient. We suggest that you go for a heater which uses diathermic oil. Diathermic oil is a great heat container. It is designed in such a way that heat can be transferred to the outer environment. Warranty is an important thing to consider while buying the best oil-filled heater. Products like these tend to be very delicate and can cause damage if not maintained properly. That is why we ask you to thoroughly check the warranty service of the heater you are going to buy. Great way to save money: when it comes to saving valuable electricity bills, oil filled heaters top other heaters in competition. Most oil filled heaters are portable in nature. This means that you can move it around from one form to the other. That way, you will not need a central heating system for your entire house, which is very costly. Oil filled heaters are also very much efficient in terms of energy. In this article, we have discussed at length how oil-filled heaters can efficiently optimize the room temperature. The best oil filled heaters use multiple sensors (a timer, adjustable thermostats) that prevent the heater from running when there is no need for that. In these ways, oil filled heaters can save you a small fortune. Silent operation: The most enjoyable distinction between a traditional heater and an oil filled heater is the level of noise produced by the units. Oil filled heaters usually do not have fans to blow the heat into the room. Rather they use thermal channels to distribute heat in the area. The lack of a fan in an oil filled heater is what makes it silent and great. You will not have to suffer the pain of hearing constant noises. That is why oil filled heaters are perfect for family use. Portability: All the oil filled heaters discussed in this article are portable. Portability is one of the key features that make them great. Not all rooms are occupied by people always. Then again, every room has its own usage in a house. So, instead of having a central heating system for your entire house, you can buy one of these portable oil filled heaters. They come with casters; that is why moving them from one place to another is very easy. You can just take the heater with you in any room as you wish and enjoy the warm environment. Safety features: The safety features that come with an oil filled heater are like no other you will ever find. They use several types of safety features to prevent any kind of damage to your house or to your heater. All oil filled heaters usually have two basic features – thermal cut-off and anti-freeze protection – and both of them are very effective to live a safe life. The thermal cut-off feature automatically shuts off the heating system when it gets overheated. On the other hand, anti-freeze protection prevents the pipes of the heater being frozen at low temperature. So, with an oil filled heater in your house, you will never have to worry for a second in your life. No need for refilling: Many people think that oil filled heaters use oil for generating heat. That is completely not true. The oil inside the heater basically works as a container for heat. Oil has a high boiling point. That means that it can contain relatively more heat than other forms of liquid. That is why oil filled heaters are very efficient. And since there is no burning of oil; you do not need to worry about refilling. The oil inside the heater is permanently sealed. So, there is no chance of leakage as well. And since the oil is not used to generate heat, the heaters do not make any fumes as a byproduct. So, the oil filled heaters non-toxic and environmentally friendly. Faster heating: One of the reasons for loving oil filled heaters is their efficiency. Oil filled heaters are made of heavy-duty stainless materials. The exterior of an oil filled heater is usually cool to touch. The metal construction allows the heat to be transferred to the room environment quickly and efficiently. Oil filled heaters are basically convection heaters. It means that they are made in such a way that they heat up the air of the room, rather than heating up the people or object in the room they operate. That is why, to use an oil filled heater efficiently, and to keep the energy bills at bay, you need to place the heater in a sealed room so that the air cannot get out. If the doors and windows of the room remain open while running the heater, air will get out of the room and you will not get the desired temperature. So, to have efficient use of your heater, seal off your room first and then turn on the heater. That way you will get maximum output and can enjoy warmth to the fullest. Despite the fact that the radiator of an oil filled heater is more efficient than other heaters, it can still cause damage. So, keep anything away from the heater that is combustible. That includes furniture, clothes, and fabrics, body spray or anything that contains alcohol. Also, put the radiator in a place where children will not be able to reach. It is not a very good idea to plug your best oil filled heater into an extension cord. Extension cords are usually dangerous to lay around your house, especially if it is covered with a carpet. Also, extension cords cannot take much load that an oil filled heater requires. Therefore, you should look for a socket to plug the heater in. If that is not convenient, use a premium quality extension cord. Many oil filled heater comes with an extension cord made specifically for that heater. No matter what happens, do not ever try to open up an oil reservoir of the heater by yourself. Oil reservoirs are usually permanently sealed. Oil reservoirs do not get damaged easily. But even if something happens to it, you should ask a licensed technician for help. Put the heater in a dry place. Never try to put somewhere damp. This may lead to electric shock and you may have to pay the price with your life. Although portable oil filled heaters provide timers that can turn the heater on or off, it is best to unplug the heater when not in use. That way, you escape any chance of damage and the electricity can be saved as well. How much heat can an oil filled heater give off? Answer: It varies from one heater to another. The amount of heat a heater can produce is usually measured by wattage. You will get different types of wattage options ranging from 600W to 1500W. How much oil is needed for an oil filled heater? Answer: It also depends on the size of the heater and the area it is designed to cover. The oil just contains the heat produced by the radiator. If you need to cover a large area, you will need a heater with a larger volume of oil. Normally, a small room of 100 square ft. can be covered with an oil filled heater containing 4 pounds of oil. Do You Need To Refill Oil Filled Heaters? Answer: No, you do not. The oil inside the heater is permanently sealed and cannot be refilled. How Much Energy Do Oil Filled Heaters use? Answer: The use of energy is related to the heat output of an oil filled heater. The heater with higher wattage option will require higher energy consumption. Similarly, a heater with a lower wattage option will require lower energy consumption. In this article, we have only talked about how great oil filled heaters are. But now we are going to enlighten you about what ceramic heaters are. Ceramic heaters are basically one type of space heaters. Ceramic heaters can warm up the surrounding area in a much faster way than an oil filled heater can. They use several ceramic plates. These plates surround a metal coil which gets heated up once electricity passes through it. The heat is then transferred to the ceramic place which is later transferred to the environment. The basic difference between an oil filled and a ceramic heater is the amount of time they need to heat up the area. Ceramic heaters do that in a much faster way. But there is a problem in that. The way the ceramic heater gets heated quickly, it also cools down in the same space. So, once you turn off your heater, you will immediately lose the warmth of the environment. So, this is pretty much everything from us about the best oil filled heaters. We hope now you have a clear understanding of oil filled heaters and will be able to take better decisions. With this, we wish you all the best with your search for endless warm and comfy days.